Please read through Guidelines (see below), Funding Priorities, and Application Information before starting the application. *Timeline is an estimate and subject to change. Minimum Project Grant Request: $500.00. Maximum Project Grant Request: $2,500.00. A post-project narrative and financial report, will be required of all grant recipients 30 days after completion of project or use of grant funds. The Final Report should include photos and / or other documentation demonstrating the use of the award. Requests must be for projects which are related arts, heritage or humanities, respond to the Cultural Plan vision and help forward Coalition’s goals. 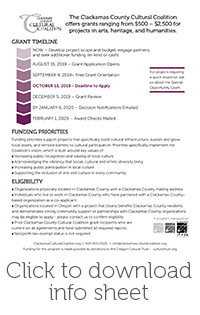 Request aligns with at least one of the current year Funding Priorities outlined in Clackamas County Cultural Plan. Requests for general operating support will not be considered. Endowment support is not eligible. Capital projects which increase the participation in arts, heritage or humanities may be considered. Please contact us to confirm eligibility before applying. If the grant benefits a minor under the age of 18, an adult representative must complete the application and final report. If you have questions about eligibility or restrictions please contact grant administrator at 503-655-0525. We strongly encourage those considering applying to attend the free Grant Orientation to learn more about submitting a grant application. A complete overview of application process is provided, along with an opportunity to ask questions and review all elements required in the application.